Bath will sign Wales back-rower Taulupe Faletau from Pro12 side Newport Gwent Dragons at the end of the season. He had been set to join them in October but a move was blocked by Warren Gatland, his national team coach. The Tonga-born 25-year-old has been capped 52 times by Wales, and represented the British and Irish Lions during the 2013 tour of Australia. "It's great news for the club, he's signed for three years," Bath head coach Mike Ford told BBC Radio Bristol. 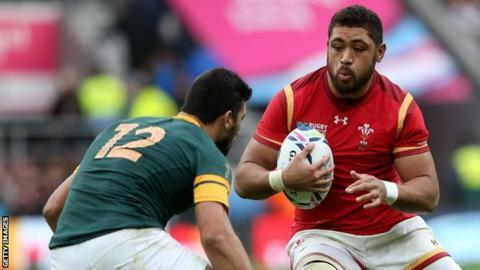 Faletau, who has been with Dragons since 2009, played four times as Wales reached the World Cup quarter-finals. "The way Bath approach the game suits my style of play," he said. "The opportunity to work with Darren (Edwards, Bath first-team coach) again after doing so with Wales Under-20s and the Dragons was also too good to turn down." A Dragons statement said: "This comes as extremely disappointing news for the club given our understanding that a national dual contract was being negotiated with the Welsh Rugby Union (WRU)." Faletau has won two Six Nations titles, including one Grand Slam. A WRU statement said it was committed to keeping its best players in the country when Faletau's transfer was turned down earlier this year. However, he will now join the Premiership club once his contract has run out in the summer of 2016, and Ford said he was delighted to finally get his man. Ford also believes the player will improve as a result of his move to the Rec. "We've been chasing him for a while, we wanted to get a deal done after the World Cup but it wasn't in our control," he added. "To be fair to Toby he's been consistent in wanting to play for Bath, he's never wavered from that. It's fantastic news. "He's got his best years ahead of him and with 52 caps he is not inexperienced. We feel we can improve his game, playing the game differently which might suit his style. "Defensively he doesn't miss tackles, attack wise you don't see it with Wales but he is a guy who can run outside channels. He can jackal the football, there are not many like that in world rugby."